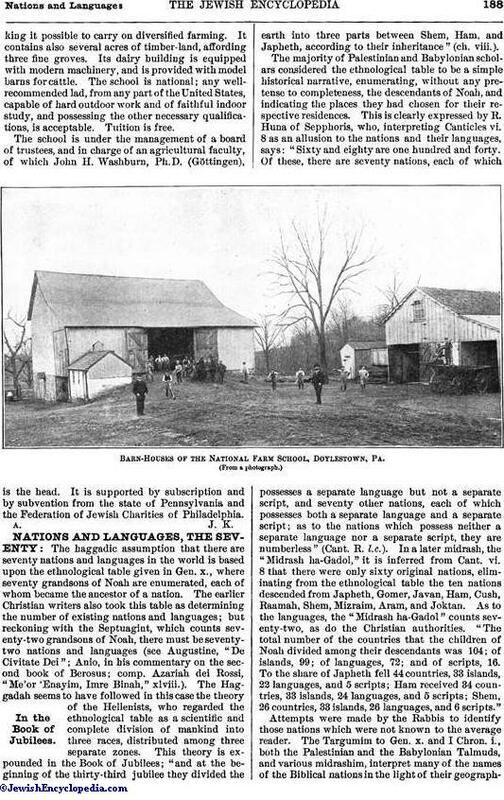 American institution having for its object the training of Jewish lads in practical and scientific agriculture; situated at Farm School, Doylestown, Bucks County, Pa. The founding of the school was proposed in 1894 by the Rev. Dr. Joseph Krauskopf, after his return from a visit to the towns within the Pale of Settlement in Russia. 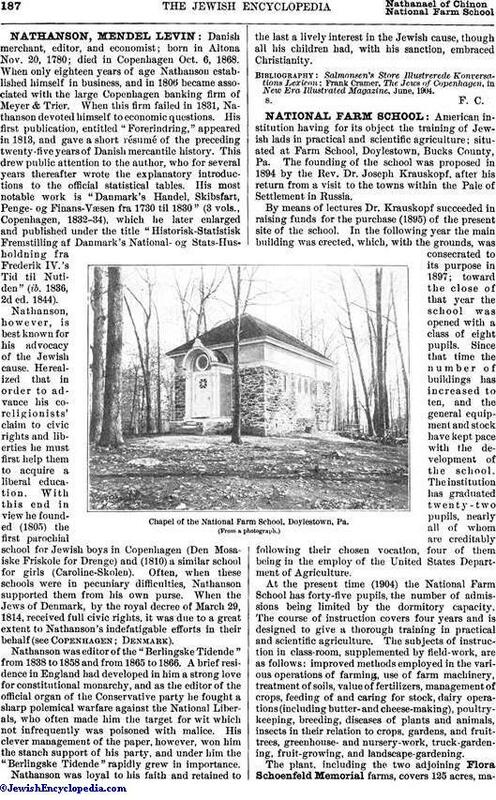 By means of lectures Dr. Krauskopf succeeded in raising funds for the purchase (1895) of the present site of the school. In the following year the main building was erected, which, with the grounds, was consecrated to its purpose in 1897; toward the close of that year the school was opened with a class of eight pupils. Since that time the number of buildings has increased to ten, and the general equipment and stock have kept pace with the development of the school. The institution has graduated twenty-two pupils, nearly all of whom are creditably following their chosen vocation, four of them being in the employ of the United States Department of Agriculture. 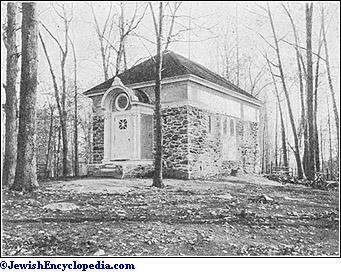 Chapel of the National Farm School, Doylestown, Pa.
At the present time (1904) the National Farm School has forty-five pupils, the number of admissions being limited by the dormitory capacity. The course of instruction covers four years and is designed to give a thorough training in practical and scientific agriculture. The subjects of instruction in class-room, supplemented by field-work, are as follows: improved methods employed in the various operations of farming, use of farm machinery, treatment of soils, value of fertilizers, management of crops, feeding of and caring for stock, dairy operations (including butter-and cheese-making), poultry-keeping, breeding, diseases of plants and animals, insects in their relation to crops, gardens, and fruit-trees, greenhouse- and nursery-work, truck-gardening, fruit-growing, and landscape-gardening. The plant, including the two adjoining Flora Schoenfeld Memorial farms, covers 125 acres, makingit possible to carry on diversified farming. It contains also several acres of timber-land, affording three fine groves. Its dairy building is equipped with modern machinery, and is provided with model barns for cattle. The school is national; any well-recommended lad, from any part of the United States, capable of hard outdoor work and of faithful indoor study, and possessing the other necessary qualifications, is acceptable. Tuition is free. The school is under the management of a board of trustees, and in charge of an agricultural faculty, of which John H. Washburn, Ph.D. (Göttingen), is the head. It is supported by subscription and by subvention from the state of Pennsylvania and the Federation of Jewish Charities of Philadelphia.